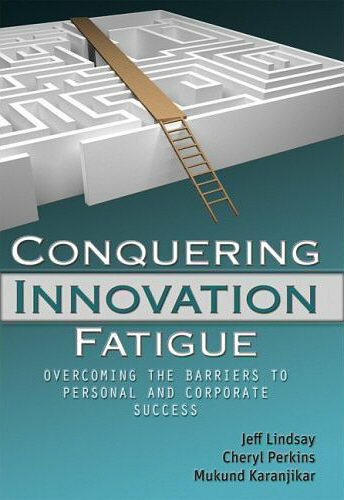 The cover for Conquering Innovation Fatigue is intended to show that there are ways to get past the maze of barriers that can hinder innovators, entrepreneurs and businesses in their quest to develop successful innovation. We looked at many different options for graphics on the cover, but I was hooked on the maze and plank after I found it and purchased it from a commercial resource. We worked with a couple of different artists and with John Wiley in considering how to place it and what color schemes and fonts to use. With the clock ticking, we ultimately ran a virtual focus group one night using a blog, Twitter, and Facebook to get feedback on a couple of different concepts from about 70 people, including some additional graphic designers. Between general responses and some outstanding reasoned and detailed feedback from some savvy members of my extended network, I was swayed toward the current layout with the maze at the top with the text below, giving emphasis to the word Innovation. I needed the virtual focus group – my co-author Cheryl Perkins favored the current layout right away. All of us hope you like it! The color scheme is meant to convey calmness and soothing to balance the stress and anxiety of innovation. Plus everyone is using reds and bright colors these days – we hope the teal theme helps the book stand out.